I was contacted by one of our excellent BadPsychics readers who spotted something in Episode 9 of Most Haunted at Standon Hall that I missed in my review. During the episode that airs on REALLY at 10pm June 9th, about half way through the episode Karl is apparently doing some filming on his own, he filmed a wheelchair moving on its own, and then a door on a sideboard unit apparently closing on its own. Now it is the sideboard we want to pay attention to, first up I want you to go watch the footage, direct on the UKTV website then I encourage you to fast forward to exactly 24 minutes and 35 seconds. And watch the scene play out. See anything funny here? Karl has placed his camcorder on a tripod, giving it a fixed location, and any time something happens when a camera is in a fixed location, you can assume something dodgy has gone on, remember the video overlay effect on episode 2 to fake the ghost? Well there is an edit here that is almost impossible to detect. Karl moves the camera to the left and just as the sideboard goes out of view, the recording is stopped, the door on the sideboard is closed, and Karl quickly returns to the camera and starts recording again, moves the camera back to the right and the door now appears to be closed as if by unseen forces. Now Karl would need to be quick in this edit due to things like shadows changing position, weather changing, a cloud etc, so he had to do it quick. Now of course the believers out there will be shouting "No Jon that's a lie, it was really a ghost, Karl never lies, we trust him 100%"
First up remember Karl lied about being a real life Samurai before Most Haunted became a thing and he got called out by experts in the field, so lying is not beyond him, hell in the same episode as this he bounces a knife off his own face! 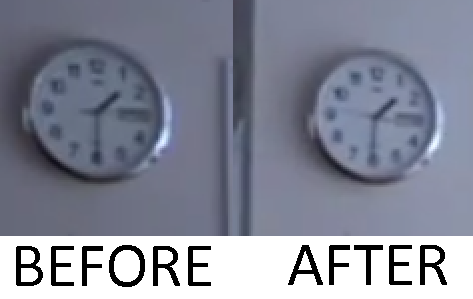 Well how do I know there is an edit in the recording, well Karl made one mistake, he didn't notice that there is a clock on the wall above the sideboard. You didn't notice it either did you? Go on be quick, go check the footage again, and concentrate on the second hand. Not the hour hand or the minute hand, but the faint second hand that counts the seconds. Now what do you see? Watch it again, count in your head from just before the camera starts to move as you can see it clearly from when it is static, as there is a slight blur when the camera starts to move. I know my screenshots are not perfect so I really do encourage you to go to the UKTV website and look for yourself. That is 29 seconds difference. Yet if you count in your head, or even get a timer out, only 11 seconds pass. And if my maths are correct that means that 18 seconds are missing. Now as you are sat there reading this thinking I am a maniac, just stop what you are doing, and count to 18 out loud. Now ask yourself, is that enough time for Karl to press one button on the camera to pause recording while it is in a static position, walk over to the door, close it, then walk back to the camera, start recording again and then finish the scene? I would say it is plenty of time. And as for the noise of the door slamming, that is easily added in later. As far as I am concerned this is conclusive proof of Most Haunted and specifically Karl Beattie faking paranormal activity, and he is exposed by his own poor quality of work. Again don't just take my word for it, go to the UKTV website and watch for yourself, am I wrong? I hear that some MH fans have said that time sped up because of the paranormal activity! All he had to do was wind the clock back slightly and no one would have have known. Also, if you watch the shadow on the floor, it disappears slightly after the cupboard door allegedly shuts. Do you see it? I see that you've mentioned the shadow change. 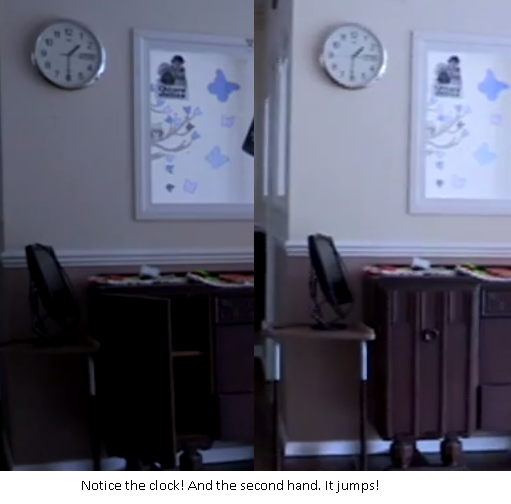 I thought it was further proof of the editing.. the timings were just off from the sound of the cupboard door shutting and the shadow of the sideboard changing. Shoddy workmanship. Just shows that you have to be incredibly quick to get away with such an edit when you are using natural light. He would have been better to have filmed this stunt at night but with all of the lights on.